Some academics can never say no to a conference invitation. Others never turn down a book review. I don’t like flying, so I am (pretty much) much one of the latter. So, for my sins, for the last few weeks I’ve been reading and writing my way towards a review essay of – two very high class pieces of US comparative political science which asks why some states in CEE have ended up with far more bloated and politicized state bureaucracies than others (both think the answer lies in the why parties compete against each other: Runaway State Building by Conor O’Dwyer and Anna Grzymała-Busse’s Rebuilding Leviathan. O’Dwyer does a narrower set of cases, but they basically agree that the Estonians and Slovenes come out on top for lean mean administration (relatively speaking), as more surprisingly do those big public sector spenders the Hungarians. The Slovaks Bulgarians, and Latvians get the booby prize. The two authors, for rather interesting reasons, disagree on the Czech and the Polish cases. Unfortunately, I enjoyed the books so much the essay underwent its own runaway growth processes and ended up as a bit of a Leviathan itself, so I spent the last few days hacking it down to size for the journal concerned. Anyone interested in the longer deluxe version can, however, download it from the link here. 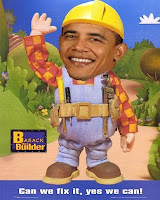 British radio comedy The Now Show wickedly points out that Barack Obama’s campaign slogan (‘Yes, we can’) is basically the same as the theme for children’s TV favourite Bob The Builder. Various right-wing American bloggers have also noticed this and there are quite a few amateurish medleys of Bob and Obama on You Tube . But isn’t that exactly what you’d expect? Both politicians of a vaguely centrist persuasion and children’s TV producers share a need to come up with nice simple, feelgood messages, which are catchy easy to understand and have some basic moral points that pretty much no one could disagree with. Frankly, I’m surprised spin doctors and political PR people have mined the children’s channels more extensively for more decent campaign slogans. My tip for any who might be reading ‘Teamwork – Do It Together’, one of the bouncing disco numbers from the frenetic pre-schoolers’ show LazyTown, Iceland’s greatest export. And, yes, Obama definitely gets my vote. >The Prague Spring: Many happy returns? Dr Tůma hadn’t been feeling too well earlier in the day, apparently, but he quickly got into his stride and his presentation wasclear, well thought out and – as you would expect of a leading Czech historian – sprinkled with interesting and subtle interpretations. It was, I thought, however, a slightly safe view of the reform process, the answer to the question posed in the lecture title was that the Prague Spring was both a top-down communist attempt to revitalize one party rule with little (or limited) democratic content and a slow but gathering emancipation of Czech society trying to ease itself out from under the communist system – a ‘refolution’ with pressure from below and cautiously (mis-)engineered change from above, to borrow the phrase Timothy Garton Ash coined for 1989. The 1968-89 parallel, Tůma suggested, was to be found in type of strategies employed by reform communist elites. He also noted that political change was – as seems typical for the Czech lands – framed in terms of ‘return’: reform communist wanted a return to 1948; socialists and radical communist reformers to the semi-pluralist managed People’s Democracy of 1945-8; and non-communist Czechs to an idealized chocolate box version of interwar Czechoslovak democracy. And on 1 January 1990 Václav Havel famously proclaimed ‘People, your government has returned to you’ and post-communist change was framed as a Return to Europe, or – if you like consuming the propaganda of the Czech right to the rich man’s club of the OECD. Like bored kids on a long car journey, Czechs are perhaps now entitled to ask ‘Have we got there yet?’ (I think the answer is yes). The Q and A brought one important and well made criticism: a key omission in Tůma’s talk, the questioner noted, was the ubiquity of socialism. It had dominated the experience and perception of events at the time. There was little evidence that Czech society was consciously or distinctly looking back to a different point of reference, than reforming the regime. Socialism then still had significant support and legitimacy in the Czech working class. I lack the historical expertise to judge this one, but I suspect this point – basically a critique of views, which view 1968 in the hindsight of 1989 – is well observed. Czech thinking about 1968 seems to have a real blind spot here, perhaps because, at bottom, Czechs are still thinking through and coming to terms with their society’s relationship with communism and socialism. Much easier then to juxtapose an essentially non-communist society – expressing underlying national democratic tradition – with the reforming, but basically separate, communist regime and Communist Party. When Czechs talk about 1968 they are always really thinking and talking about themselves and their society as it is and where it is going now. This rather contrasts with the profusion of flatulent retrospectives about the Western 1968‘. It occurred to me as my mind wandered a bit that if some people needed reminding that in 1968, socialism was (on) the agenda – at least in Czechoslovakia – others need reminding the left-libertarian agenda that burst forth then are either on the historical scrapheap or firmly entrenched in the mainstream. Why does there have to be endless series backward-looking intellectual nostalgiafests? I suppose because of the cultural power of a baby boomer generation of soon-to-retire academics and journalists, for whom 1968 was a never-to-be-forgotten golden moment Maybe in ten or fifteen years time, when the participants have finally moved on, 1968 will simply be studied as history. You know you’re getting middle aged when you start to agree with Timothy Garton Ash, but I can’t help thinking he was right to point out that 1968 and the May events was a merely historical hiccup compared with 1989 and that it was all, basically, a staging post to our current mainstream mix of social and economic liberalism. Meanwhile back at the Czech Embassy, the Q and A at also revealed that Russian archives concerns the August 1968 invasion – bar a few carefully selected morsels – are largely still classified and inaccessible (a mixture of grinding post-Soviet bureaucracy and lack of political will) and that, while Czech and Slovak experiences of reform communism (and the communist regime generally) were rather different, Czech and Slovak historiography approaches 1968 in broadly similar ways. Vive la refolution! The long awaited, much heralded but uncompleted but much partially leaked next album by Guns ‘n’ Roses for which fans have been waiting fifteen years is, apparently entitled, Chinese Democracy. This suggests a wry sense of humour and/or an unexpected sensitivity to global politics on the part of the ever changing line up of LA rockers because much of 21st century politics seems likely to be a similarly confused and expectant wait for the real thing. I have, for once, been reading a book that is not about Eastern Europe – What Does China Think by Mark Leonard, a discussion of Chinese debates about the country’s future by the former head of the Blairite Foreign Policy Centre thinktank, who has since moved on to the European Council on Foreign Relations and become an ‘accidental sinologist’. As one might expect of a leading thinktanker it’s a consise, fluent and readable: I remember when Leonard came to SSEES a few years ago he did an excellent, well practised presentation on ‘Global Europe’ despite a streaming cold. What Does China Think is interesting and illuminating, but a litle disappointingly holds few real jolting surprises about what China’s wonks, intellectuals and politicians are variously thinking for anyone familair with the political and social landscape of late communist Europe. There is a neo-liberal ‘new right’ suspicious of state power, which wants to make a full transition to a private property-based capitalist economy (and possible democracy, or a form of democracy). More powerful and open than the neo-liberal technocrats squirreled away communist Eastern Europe, admittedly, and, of course, with a powerful private sector to draw on, whose nearest CEE equivalent was probably Hungary’s much smaller ‘second economy’. In China this vies with a ‘new left’ concerned about the socially and ecologically corrosive effects of inequality and untrammelled growth, which it wants to rein in using a more capable modernized and pro-active central state. Although there have been much publicized experiments with multi-candidate elections at local and (rarely) municipal level – sometime with a perestroika style filtering of candidates – Leonard sees the future of Chinese ‘democracy’ in technocratically directed public consultation and input into policy-making. Indeed, as this parallels developments in the West, he even sees it as rather sophisticated alternative to competitive electoral democracy. Possibly, the boot should be on the other foot: if the Chinese Communist Party can use them, then we might worry that experiments with ‘citizen juries’ and the like are simply shoring up elite-dominated political systems. Indeed, Avizier Tucker makes precisely this point in a recent issue of Political Studies. Leonard is, unsurprisingly, rather more interesting on foreign policy. Chinese thinkers are divided as to whether to openly admit or conceal that China is a rising power and desperate to learn from the mistakes of others. ‘Neo-comms’ want to assert Chinese power, if necessary ultimately militarily against Taiwan, while ‘liberal internationalists’ are genuinely committed engagement with multi-lateral institutions. In practice, China is using multi-national institutions to achieve national interests (holding the USA in check) and to create (what are in form) new regional multi-lateral institutions, which serve to boost Chinese power. There is also the beginning of a projection of ‘soft power’: exporting the Chinese developmental and political model of state capitalism and strong sovereignty to Africa, promotion of Chinese language and culture internationally, sophisticated English language media, a well-trained, soft-spoken diplomatic and academic elites. Here all parallels with CEE – a region always controlled, not controlling – fall away and we have to look to more distant historical paralles with rising powers such as Japan or Imperial Germany. Bulgarian President Georgi Parvanov presented Tuesday his proposal for the reform of the political model in Bulgaria, focusing on the three main points that could lead to real political results. The three points included in the President’s proposal are: the necessity of legal and public guarantees for a national representation of the political parties, transparency regarding Party financing and regaining of voters’ trust through a reform of the election system. In order to participate in elections, a Party must have registered structures in 2/3 of the municipalities. Only parties who have received 1% (2% for coalitions) from the vote during the previous parliamentary elections would be able to participate in local elections. They would be the only ones to designate candidates for mayors and create election lists. Independent mayoral candidates and independent Councilmen would be acceptable, but not lists that are not clearly related to a political Party. Discontinue financing of political parties by legal entities; increase State subsidy for parties receiving over 1% at the last parliamentary vote. Public register of individual donors with a preset limit for the donation amount; public register for the Advertising and PR agencies serving particular parties. For election participation, in addition to the requirement that the Party registers with the Central Election Commission, it must also register a public payment account where all donations would be deposited and all money to pay for election campaigning would come from. Delegating rights, human resources and experts to the National Audit Office for control over Party finances, election campaigns and activity of the advertising and PR agencies. Each election campaign would be subject of finance check-up by the National Audit Office. If the campaign has not been paid for from the payment account officially registered by the Party, the Party would be sanctioned. The National Audit Office would have the right to check the Party accounting books. Sanctions that could be imposed by the National Audit Office in case of finance violations include elections’ results cancellation, disallowing the Party participation in the next elections and others. Discontinuation of the renting of Party club facilities to third parties either by directly forbidding the renting or by turning the rent into a public or State rent determined by the average market price for the region. Maintaining the proportional character of the election system in order to guarantee the leading political will and responsibility of the political Party. Majority candidates would run in big single mandate election regions to contribute to their public recognition and allowing effective control over vote purchasing. >Another referendum, another master plan derailed? Never mind the Irish referendum – a predictable outcome, which allowed the EU’s carefully crafted constitutional compromise to become the target of a set of contradictory anxieties and antagonisms and allowed voters to give the political establishment a kick up the backside (hard to resist in any democracy) – the most interesting referendum I’ve come across of late is the one in the neighbouring commuter town of Haywards Heath. The local district council in collaboration with Thornfield Properties has been trying to push through a 20 year masterplan for the grandiose redevelopment of HH and its satellite town of Burgess Hill with many details – despite some careful top down ‘consultation’ – rather vague or rather confidential. Many locals suspected they weren’t getting a good deal – too many civic and community facilities bulldozed, too little certainty of proper replacements – and thought the relationship of Thornfield, the district council’s chief executive and the councillors a little too opaque and a little too cosy. In HH opponents, including the Liberal opposition and the town’s long serving single Labour councillor, organized in the Haywards Heath Referendum Group, used fairly new legal provisions to force a local (consultative) referendum on the plan: half a day’s voting, 20% turnout of the town’s 19,000 voters with almost 94% voting to put the plan on hold until fuller information is available. Local elected worthies and council bureaucrats – the (appointed) chief executive seems to play a surprisingly prominent role in all this – don’t quite have an EU-sized dilemma as they can, in theory, ignore the result, but there will be political pressure to respond to this obvious public thumbs down. As in the EU, consultation’ and a pause for reflection seem likely until civic opposition dies down. Then I imagine they’ll just go ahead with what they planned anyway – certainly the local press seems to think so. I sat up till 1am sorting through paperwork with BBC4’s Margaret Thatcher Night on in the background. 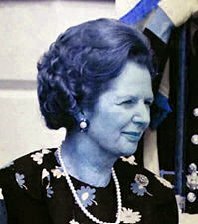 Oddly, the most compelling thing – perhaps because it dealt with British politics herself, rather than the Iron Lady herself – was the repeat of the rolling 1979 election night coverage. Just listening to the sound and not really looking at the weird clothes, more basic sets and graphics, it sounded entirely modern: exactly, the same tone, format and content as you can hear now, although perhaps a bit slower and more erudite in places. Who would have known that Cheltenham (then a safe-ish Tory seat, now a Liberal marginal) had an independent MP in the 1930s and 1940s? The election was at lot closer than tends to be remembered now as views seem to be skewed with the hindsight that it led to 18 years of Conservative rule, ‘Thatcherism’, and the near collapse of the Labour Party. As the documentaries earlier in the evening had pointed out, Mrs T – although not exactly playing a blinder in the election campaign itself – managed to keep the radicalism of her beliefs safely under wraps. Conservative commentators in the studio like Peregrine Worsthorne are more fully bloodedly anti-state and anti-trade union, but somehow opponents around the table don’t seem to take what they say as a statement of serious intent. Most people interviewed on the street in vox pops backing the Tories just seem to want something different. The old style psephology of the period with very limited computing power managed to pick up the basic pattern of the results and forecast the result impressively quickly and accurately, within the first dozen or so result coming in: the Tories were in with a comfortable majority driven by heavy swings in the South and Midlands, which got weaker the further North you went. More interesting though were the undercurrents in British politics the election flagged, not apparent at the time: the relatively good performance of the Liberals (I was surprised the expression ‘tactical voting’ was used then), although having slip back from the 18-19% they had gained in 1974 and picked up only a few seats, it didn’t seem so at the time; the Ecology Party pick up a 1000 votes in Torbay, suggesting – very distantly – a potential for a viable Green Party; there is an emergent North-South and English-Scottish divide, but no one talks about these issues very much except to note the losses of the Scottish Nationalists to Labour. Another contemporary but not-so-contemporary echo is the presence of the (then declining) far right at the political margins. The anti-fascist website Norfolk Unity reports that the far-right British National Party concluded a electoral alliance in Stoke on Trent with one of the UK’s tiny Pensioners Party (not to be confused with the equally obscure Senior Citizens Party which field candidates in the 2005 general election). There is fuller clarification on the the Labourhome blog, which makes it clear that the PP’s leadership quickly backed away from the association with the BNP and the link to its recommendations for the local elections in Stoke is now defunct. As the town is one of the BNP’s local strongholds as most recently reported in The Guardian, it is perhaps a little surprising that the BNP should have bothered. On the other hand, it does fit with thr far-right group’s successful strategy of normalising itself at local level through visibility and self-presentation as ‘community champions’. In addition to this well chosen strategy. Stoke has the classic profile of the BNPs other local strongholds such as Burnley (see excellent conference paper by James Rhodes) or Barking (covered last year in a report for the Joseph Rowntree Foundation): fairly homogenous areas of white working class populations, industrial decline, electoral and organizational collapse of once dominant Labour party, weakness and unpopularity of more bourgeois alternatives (Conservatives, Liberals). Perhaps worth remarking in passing the Flemish pensioners’ group Ageing with Dignity (WOW) was absorbed by the Antwerp branch of the sizeable radical right populist Flemish Bloc (now Flemish Interest). Indeed, many other pensioners parties in West Europe lean more to right than left. The rest of Norfolk Unity the post is a long well informed discussion of the internal politics of the BNP (surely Britain’s most well researched, extensively reported and well blogged minor party), which – presumably in an attempt to add to it factional discord – is targeted at criticising its current leadership. All good work, but, as with many exposes of the far-right I have read over the years, I could help feeling that there was a slightly odd symbiosis between fascists and anti-fascists, almost as if the writers were themselves part of the BNP’s own little universe.